My first experience with season extension structures was a cold frame. I have found cold frames to be of best use as solar powered plant starters. I grow lots of seedlings in my two cold frames, beginning with brassicas plants in February and ending with brassicas plants and lettuce in September. In September, I set out the kale, collard, and maybe chard plants into beds that will have a low tunnel over them for the winter and I space the lettuce seedlings around inside the cold frame. I harvest the lettuce on a cut-and-come-again basis until about Christmas. By that time it will have become somewhat tough and weathered, having been frozen and thawed many times, even with the glass lid on. I leave it go and by about February 10 I clean out the cold frame and plant the first seeds for spring transplants. One year I planted onion seeds there on January 10. I’d do that more often if I remembered to order the onion seeds in time. Each time I harvest seedlings, some soil goes with them. Each time I plant seeds, I add compost before planting. Over the years, I have put collards and kale in the cold frames to harvest all winter. That was okay, except for the fact that in February it is still there going strong when I need the space to start seeds. I don’t start anything in the house anymore. About the third week of March, and for sure by the beginning of April, I have set out the cool weather plants in the garden, mainly brassicas, chard, and lettuce, leaving room for the tomatoes, peppers, flowers and whatever other warm weather things I’m starting in the cold frame. My last frost date is around April 25. The soil will warm up in the cold frame with the lid on and those warm weather things will sprout. I open the lid on warm days and close it at night. You don’t want to have cool weather crops still in the cold frame when you put in the warm weather seeds. By that time the lid needs to be off for the cool crops and it needs to be on for the crops requiring warmer weather. If their occupation time in the cold frame overlaps, you would do well to have two separate cold frames. Anyone who has started tomatoes and peppers at the same time knows that peppers take longer to germinate. They also like warmer soil. Usually I treat them the same as the tomatoes, but I’ve considered covering the pepper seeds with a cloche of some sort inside the cold frame to provide extra warmth. When the tomatoes and peppers come out, the sweet potatoes go in to produce slips. By that time the lid is put away for the summer and the cold frame is just a safe place to produce transplants. There always seems to be something to put in there. I used to start my tomatoes and peppers on March 1 in the house under lights. They would require careful attention in the house, then more attention to harden them off so that they would be prepared for the elements when I set them out in the garden. Starting the seeds in the cold frame is a whole lot easier. 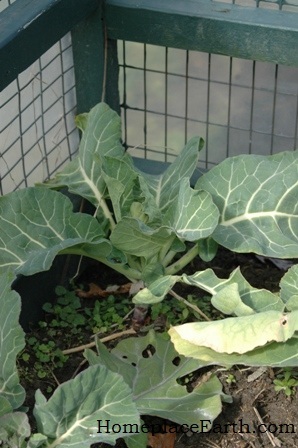 The plants produced in the cold frame don’t need further hardening off. If too many seedlings are crowded together, I might prick them out and put them in pots or flats to have some more space to grow before putting them in the garden. I used Four Season Harvest by Eliot Coleman as a guide for my cold frames. A friend gave me two 3’x6′ pieces of glass, so I made the cold frames to that size. The low side is from a 2×8 and the back is from a 2×12. I took Coleman’s suggestion to add a 2×2 along the bottom so that when it starts to rot, I could replace the 2×2. My cold frame sits on solid cement blocks that serve to raise it a bit and to protect the bottom from rotting. My cold frames are made of untreated pine and painted with latex paint. The 3’x6′ wood-framed glass lid is heavy and it takes two of us to put it away each year. I notched a 2×2 to lift the lid for venting, as shown in Four Season Harvest. I never hinge a lid to the frame. If you do that, the only way you can vent it is to lift the lid. Sometimes on warm days it needs to be removed completely. 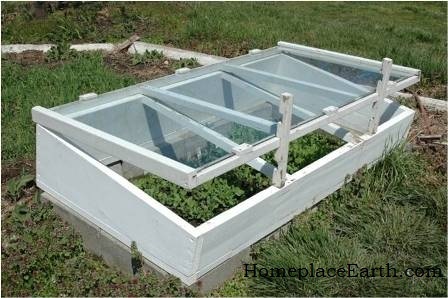 Cold frames can heat up quickly when the sun is shining. Sometimes it is to your advantage to just slide the lid one way or another to vent slightly to keep from overheating. 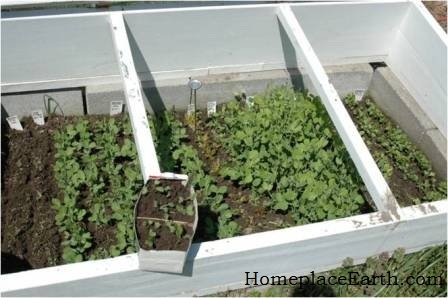 Rather than have a large lid I think it is better to have two or more lids that can be stacked on the cold frame to allow venting, but still provide some protection. When they are removed in the garden temporarily, or stored away for the season, they wouldn’t take up so much room as one large lid. When one of my glass lids broke I used 2′ wide pieces of twinwall panels, also a second-hand gift from a friend, resting them on the cold frame and shifting or stacking them as needed. 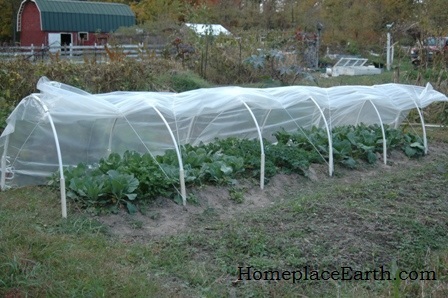 Although I would like to not have any plastic in my garden, most years I use a low tunnel made from plastic hoops covered with greenhouse plastic to protect collards, kale, and chard over the winter. At 2 1/2′ tall it allows more space for the greens than the cold frame. I can usually harvest once a week, skipping a week in the coldest times. Here in zone 7, I’ve found that I don’t have to close the ends, although I keep a piece of plastic handy to put over the ends if it really gets cold. This structure protects the plants and doesn’t need as much attention as a cold frame. I transplant the winter greens in early September, but they don’t need to be covered until late October or early November. You want the rodents in your garden to find cozy homes elsewhere before you put the cover on. You can use regular construction plastic for the cover. It’s best to make sure it’s 6 mil thick. There are clips made especially for attaching the plastic to the hoops and I recommend them. I only need them for the ends. My low tunnels have a ridge pole along the top, attached with a screw at each hoop. The hoops are no more than 4′ apart. I use 8′ lengths of plastic pipe to cover a 4′ wide bed. The ends of these hoops fit into pieces of larger diameter pipe. This larger size pipe is cut to 2′ lengths and is put one foot into the ground with the other end sticking up for the hoops to fit into. I put screw eyes (going through both pipes) on alternate hoops along each side to slide the nylon cord through that I use over the plastic to hold it to the hoops. With this method I don’t need to use any weights, rocks, boards, etc. to hold the plastic down and it is easy to raise it up for harvesting or for venting. To the screw eye on each end, I attach a bungie cord that the nylon cord is tied to. This provides tension to hold things tight. In the summer, shade cloth can be exchanged for the plastic. These low tunnels are nice, but in the spring the winds can be pretty strong. When the sides are raised for venting, the winds can be harsh and I thought that being able to keep the sides closed and opening the top to the rain would be nice. Of course, that sounds like the cold frame, but I wanted a taller structure. I have used 2′ tall mini-greenhouses that I made from chicken tractors that were no longer useful in the field. I installed vents in them that open at 70 degrees and close at 40 degrees. They are the same kind of vents that you can use in the crawl space of your house. In the home building stores you would probably find them near the cement blocks. For a 4’x8′ mini-greenhouse I made two 2’x8′ lids hinged together. 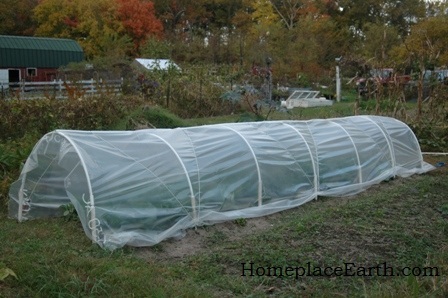 I could just fold one over the other to vent or remove the whole thing and lean it against the mini-greenhouse. When the lid was on it was held to the structure with hooks and eyes. I enjoyed using that to harvest winter greens out of. It had fence wire under the plastic covering, so that I could take the plastic off and the wire would still protect the plants from rabbits. The mini-greenhouse has a lot of advantages. Leaning into it to harvest greens was no problem, however it was inconvenient to plant seed seeds or do close weeding. Rather than the 8′ long lids, a series of 2’x4′ lids would be better, hinging 2 panels together and folding one on top of the other for venting. When they are removed they can be stacked to take up less space. When it comes to season extension you need to think through exactly what you want to do. The 12-Month Gardener by Jeff Ashton has a lot of good ideas for cold frames. Consider carefully the plants you put in them. Although these structures provide some protection, you will be growing cold hardy, not tender crops throughout the winter. Four Season Harvest can help with crop choices and timing. Territorial Seed Company pays particular attention to crops for winter harvest. They even put out a winter catalog in July. There are many ways to extend your gardening season. I hope you make use of some of them so that you can eat from your garden all year. Earthquakes and hurricanes! Some of you from far away may be wondering how we’ve fared with the earthquake so close and Hurricane Irene coming past on her way to Vermont. First, about that earthquake. Here in Ashland, Virginia we are about a 45 minute drive from the epicenter. Out there it did considerable damage in places, closing two schools that may have to be rebuilt. I was sitting on the back porch and suddenly felt the house shaking behind me. Some people who were walking or driving in Richmond at the time may not have felt a thing, but if they were in a building they did. It was big excitement for sure around here, but no damage at our place. People needed to check their plumbing and chimneys to make sure nothing shook loose. We also escaped damage from the hurricane. We can count our blessings that the only disruption for us was that our electricity was out for four days. Many big trees came down in the area, some on houses, but I remember much more damage from Hurricane Isabel in 2003. At that time we lost power for 5 days and some lost it for two weeks. Say a prayer for the people in Vermont who suffered so much flooding from Irene. Since our electricity was out, my access to the news was limited to what was in the local paper, so I’m not up on the details. I just know things were pretty bad up there. All of this has made me really think about our food supply and general household management. If a tree falls on your house or a flood washes it away, you have way more problems. My thoughts here are about managing without electricity. So far, when the big power outages have come, they are expected in the form of snow and ice storms and hurricanes. I make sure the laundry is done up and the house is clean, since I wouldn’t be able to vacuum. I would already be thinking about emptying the refrigerator. What I’m worried about is that there will come a time in the not so distant future that the power grid will go down SUDDENLY while we are all about our everyday lives. After a few days, and for sure, by the end of a week, the challenges of a sudden change in lifestyle begin to take their toll. Those with no thought or preparation for these changes are hit the hardest and even twenty-four hours without electricity is stressful enough for them. For us the biggest challenge is water, since we have a well with an electric pump. We have some rain barrels so there is always water available for toilet flushing, even without warning. Anticipating a power outage, I fill lots of containers with clean water in the house to use for cooking and drinking. For Irene, I thoroughly cleaned four five-gallon buckets and put them out to catch rainwater (after the roof was washed from the rain) and used that water for washing dishes and ourselves. We used it conservatively and only needed two buckets before the power was restored. A hand pump on our shallow well would be a good thing to have. Refrigeration is probably our next biggest challenge. In 2001 we were gone for two weeks for the first time ever. We returned home to find that our freezer filled with meat had stopped working. At one time we had a milk cow and raised our own beef. We sold the cow in 1996 and began buying beef, a year’s supply at a time, from a friend. However, by 2001 there were farms where we could buy grass-fed beef by the cut. Besides that, we were eating less meat and concentrating on eating more in season from the garden all year. We decided not to have the freezer repaired and make do with the freezer on the refrigerator. Also, if the power would ever go out, I didn’t want to have to worry about keeping a freezer going. Many people have generators, but my husband and I really dislike the noise they make. Power outages often push people outside, with the TVs and computers turned off. It is a nice time to sit on the porch in the evening or eat dinner at the picnic table in the fading light. The noise pollution from the neighborhood generators, however, makes it not so nice. Without a separate freezer we only had to worry about the fridge in the kitchen. We ate a lot of food and put the rest in a cooler with ice. My food preservation methods are drying, canning, and fermenting so what I had put up was safe. 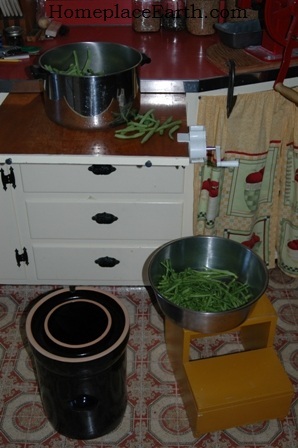 In fact, during the time the power was out, I salted down beans from the garden in a crock and dried tomatoes and peppers in the solar dryers. In case of flooding it is advisable to keep all your stored food off the floor. You can elevate crocks at least an inch or two by putting them on rolling platforms, which makes it easier anyway when you have to move them. In case of shaking from an earthquake, it is advisable to have the shelves firmly attached to the wall and to make sure they are strong enough to hold what you put there. I will be speaking about Low Energy Food Preservation at the Heritage Harvest Festival on September 17, 2011. Sandor Katz, author of Wild Fermentation, will also be there. Find more information at http://www.heritageharvestfestival.com/ I’ll also be giving a presentation on garden planning. To cook our meals we used the solar oven and gas grill. The grill is my husband’s domain, so it was kind of nice having him make oatmeal or pancakes in the mornings. I would not want to depend on the gas grill for an extended period, since the fuel could be hard to get when there are shortages and everyone is after it. Besides, it depends on fossil fuel and I’m trying to move away from that. I used a Kelly Kettle to boil water for tea. That is really great to have and works well with the dried food. You can boil water using sticks as fuel! Using the same principle is the rocket stove. I didn’t need it for this disruption, but I have one that I should use more often so that it becomes another way of life. This summer the solar oven has gotten a good workout. One thing about hurricanes, usually nice sunny days follow. We have a wood stove in the house and in the winter I can use that to cook on and heat water if necessary. Otherwise, I would use the rocket stove much more. You just need sticks! 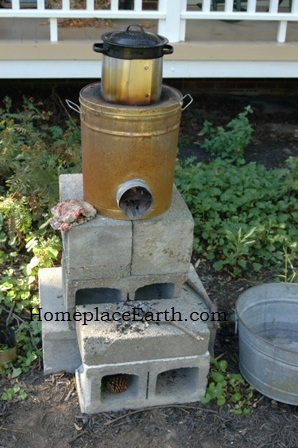 You can find directions to make a rocket stove at http://www.aprovecho.net/offerings/publications/. Download the publication Capturing Heat II and check out the rest of the website. 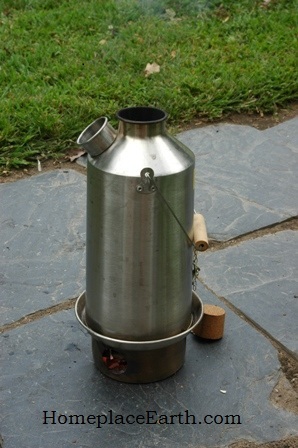 To make my rocket stove I used a lard can that I purchased at a hardware store. You can build a rocket stove! Lighting was taken care of mostly with our Aladdin lamp, which was a Y2K purchase from Lehmans. It gives enough light to read by, which we did in the evenings after dark when we weren’t playing Scrabble or Dominoes. We also used candles and flashlights when necessary. 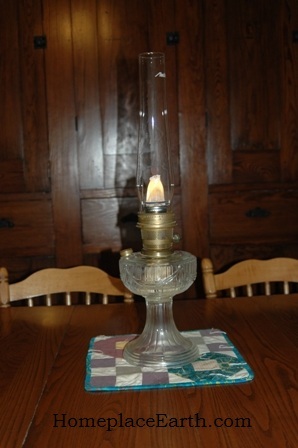 The oil in the lamp was Ultra-Pure oil which is liquid paraffin. The candles were beeswax. In fact, we made more candles during the power outage by melting wax in the solar oven and pouring it into molds. The wax was saved from the cappings gleaned when we harvested the honey in June. Longer term accommodations could be made by adjusting our activities to make the best use of the daylight both inside and outside the house. A more major adjustment might be skylights. How can you prepare for similar disruptions? Think of challenges as new opportunities. Learn new skills and begin acquiring the tools you will need. Even if you never have to use them in dire emergencies, it will give you peace-of-mind to know you can. During the power outage, my grandson and I visited Monticello, a trip we had planned for weeks. I couldn’t stop thinking of how that whole place was run without electricity back in the day. We can learn a lot from history. Once you have the skills and tools, you will have already begun transitioning your life to a new one. I have not read it, but there is a book called Transition Handbook which has spurred the Transition Town Movement. You can find more information at http://www.transitionus.org/. If we really want to transition away from a fossil fuel economy, we need to think about it as communities. Yes, we need to stock our pantries, have food coming from our gardens year-round, and look to the needs of our families. At the same time, we need to support community efforts toward taking care of everyone. If you know something, teach it to others who want to learn. It will take some time, but we can make changes that will benefit our families and communities for the long term, no matter what happens. Enjoy the journey!